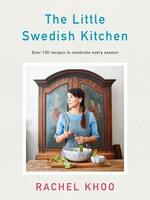 A sweet, festive treat from Rachel Khoo’s Little Swedish Kitchen. Traditionally these coconut treats are densely packed just with coconut, but upon burning half my coconut while toasting it I ended up improvising with sesame seeds and ground almonds, only to discover how delicious these nutty additions are. The berries on top lend a bit of tartness, which balances the sweetness from the white chocolate and makes for a pretty little pink peak. Put the sugar, salt, lemon zest and butter into a saucepan and melt over a medium heat. Set aside. Pour the coconut on to a large tray lined with baking paper and place in the oven for 5 minutes or until fairly well toasted. Keep a close watch, and stir the coconut occasionally to toast it evenly. When the coconut is ready, take out of the oven and pour into a large bowl with the sesame seeds and ground almonds. Mix together, then pour in the melted butter and mix again. Add the eggs, then stir together until everything is well combined. Leave to cool slightly. Line a baking tray with baking paper. Form the mixture into 20 small pyramids (about 4cm high and 5cm in diameter) and set on the lined tray. Place in the oven and bake for 20–25 minutes or until slightly golden on the peaks and firm to the touch. Remove from the oven and leave to cool on a wire rack while melting the chocolate. Break up the chocolate and put into a small heatproof bowl over a saucepan of simmering water, ensuring the bottom of the bowl doesn’t touch the water. Leave to melt, stirring occasionally. Once the chocolate has melted, dip the cakes into it and top each one with 3–4 berries of your choice. Top tips / Dip in chocolate while the macaroons are still warm, as the chocolate will run down them better. White chocolate can be replaced with dark or totally omitted if you want to keep it simple. Get ahead / These keep for several days in an airtight container.